NASA's Cassini spacecraft captured this view of Saturn's "Death Star" moon Mimas on Nov. 19, 2016, from a distance of about 53,000 miles (85,000 kilometers). 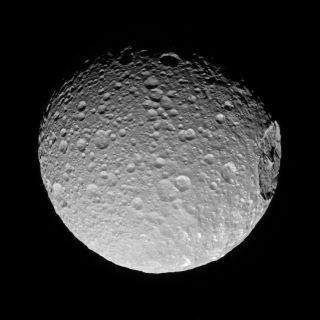 A gorgeous new photo makes it clear why so many people call the battered Saturn satellite Mimas "the Death Star moon." Mimas' resemblance to the "Star Wars" superweapon is clear in the newly released image, which was captured by NASA's Saturn-orbiting Cassini spacecraft on Nov. 19, 2016, from a distance of 53,000 miles (85,000 kilometers). "A big enough impact could potentially break up a moon," NASA officials wrote today (March 13) in a description of the photo. "Luckily for Mimas, whatever created Herschel was not quite big enough to cause that level of disruption." Mimas is not the only one of Saturn's 62 known moons that has an odd or striking resemblance. For example, the satellites Iapetus and Pan both have equatorial ridges that make them look like food — a walnut and a ravioli, respectively (though if you want to push Pan as a space empanada, I won't argue with you). Cassini is nearly done with its groundbreaking $3.2 billion mission, which is a collaboration involving NASA, the European Space Agency and the Italian Space Agency. Next month, the probe — which began orbiting the ringed planet in July 2004 — will begin the "Grand Finale" phase of its mission, which consists of 22 orbits between Saturn's cloud tops and the planet's innermost ring. Finally, on Sept. 15, Cassini will plunge intentionally into Saturn's thick atmosphere. This suicide dive is intended to make sure the probe doesn't contaminate Titan or Enceladus — two Saturn moons that may be capable of supporting life — with microbes from Earth, NASA officials have said.